ASTON SOMERVILLE : Marriages(I) 1661-1812: Boyd's marriage index [Typescript.] IN: Boyd's marriage index Published , 1925-55 Author Roe, E A Author Boyd, Percival ed. Source D: P Boyd. 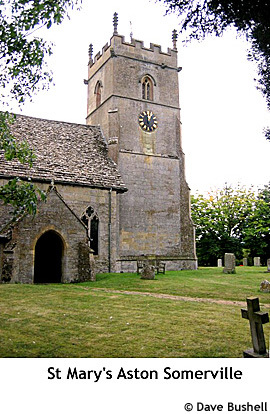 ASTON-SOMERVILLE, a parish in the lower division of the hundred of KIFTSGATE, county of GLOUCESTER, 7¼ miles (N. by E.) from Winchcombe, containing 110 inhabitants. The living is a rectory, in the archdeaconry and diocese of Gloucester, rated in the king's books at £9. 3. 4., and in the patronage of Lord Somerville. This parish, with others, is within the jurisdiction of a court leet and baron held occasionally at Winchcombe. The late Lord Somerville, who first introduced the breed of Merino sheep into this country, and author of several tracts and essays on Agriculture and Rural Economy, was born here, in 1765.